I'm definitely not the only caker and baker in my family. My older sisters knew a thing or two about sweet stuff before I could even spell sweet stuff. Meet my big sister Jossy. In a clean and dry bowl, using an electric mixer, beat egg-whites until soft peaks form. Gradually add sugar, one tablespoon at a time, beating until sugar dissolves. Beat in cocoa, cornflour and cream of tartar. Fold in hazelnut meal. Divide the meringue between circles and spread evenly with a palate knife. Bake for 15-25 minutes, until crisp. Turn oven off and allow the meringue to cool in the oven with door ajar for at least half an hour. In short bursts of 10 seconds, warm the Nutella up in the microwave to make it easier to spread/drizzle. 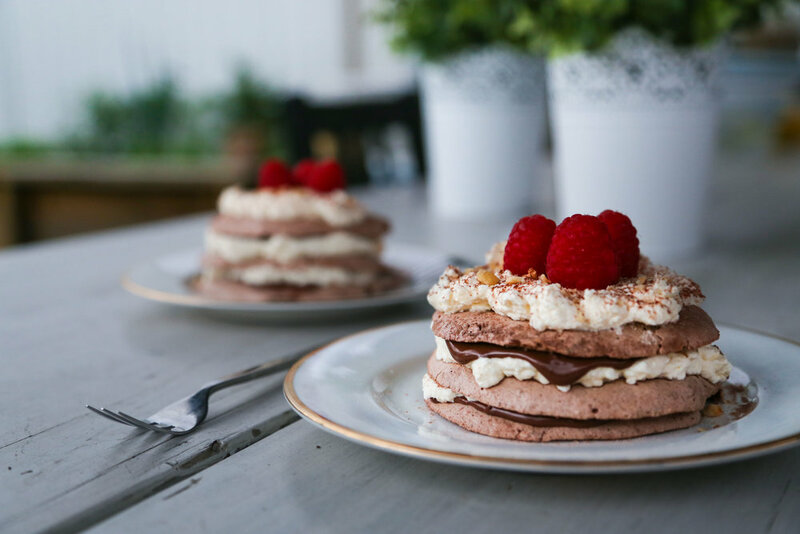 Spread one meringue with a teaspoon of nutella, then spread a heaped tablespoon of whipped cream over the nutella. Finish with cream and sprinkle with toasted hazelnuts and dusting of cocoa. Enjoy!